When you want to understand a culture, you should always find a way inside it. In New Orleans, the Blues provide an entire story in the space of a smoky, underground bar. In Lisbon, go to Alfama and you’ll hear the Portuguese singing fados, accompanied by tears of passion. Or listen to an amateur group of friends singing rembetiko together, gathered in a Greek tavern in Piraeus, the port of Athens – a particular aspect of Greek culture that Rembetiko attempts to capture. It was in the early 80’s that a young director, Costas Ferris, decided to put together a film detailing the history of rembetiko. 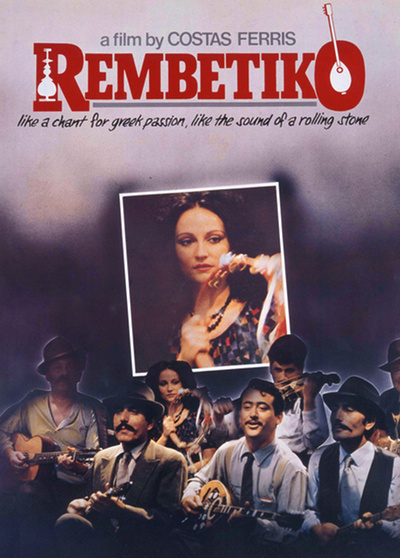 His basic idea was to centre his film on the life of legendary female rembetiko singer, Marika Ninou. In this way, through Ninou’s life, alongside the lyrics of Greek songwriter Nikos Gatsos, the viewer is presented with a unique and all-encompassing history of Greece. Her life starts in Smyrna — and following the Asia Minor disaster (leading to the misplacement of over 2 million refugees), continues with glory in Greece and in America (USA, Canada, Argentina) until her death in Athens. Her rise as a singer is shadowed by key moments in Greek history from such as the Nazi occupation and the Civil War. Her life is full of torment, and her pain is evident in her singing. Marika Ninou is as cherished in Greece as Edith Piaf is in France.